Fantasy flowers garden wedding from celebrity! Kim Kardashian married before the rose wall and Kate Moss walked down the aisle of the white flowers…… who’s “Love Garden” is more poetic? There will always be embellished with flowers at romantic wedding, from the bride’s bouquet, table decorations, to flowers decorated arches and wall. These fragrant blooming natural elves sweep secular troubles, brought stunning dramatic effect. Many big stars’ wedding also won’t lack floral design to “help out”. 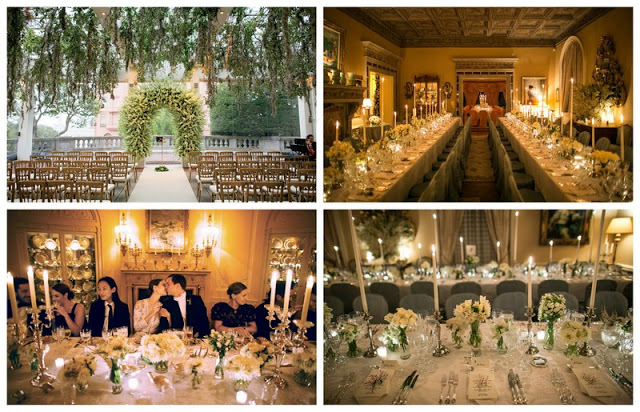 Today we will take you to review the classic elements of those romantic weddings, take a look at which stars’ “Garden Wedding” is more beautiful! Kim Kardashian and Kanye West wedding site layout a huge white wall, the couple kissing before the wall was very beautiful; socialite Ivanka Trump’s wedding as beautiful as a fairy scene, Fender roses and butterfly orchid bring pure fantasy scene; supermodel Kate Moss’s wedding, leading to the church’s white “flower road” so beautiful that people forget to breathe …… Which celebrity’s wedding floral arrangement made you tempted? Let’s look through it together now! 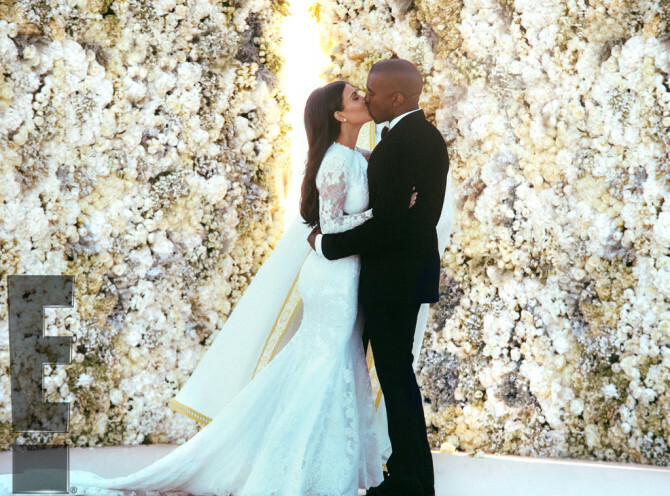 Kim Kardashian and Kanye West Wedding – huge flower wall to create a romantic atmosphere. Kim Kardashian and Kanye West wedding held in Florence, Italy, site layout a beautiful white flower wall, the happy couple kissing before the flower wall, then holding hands step to the altar. Dressing Givenchy gorgeous romantic wedding dress and standing together with Kanye West in such beautiful flowers ocean, Kim Kardashian was really beautiful at this moment. 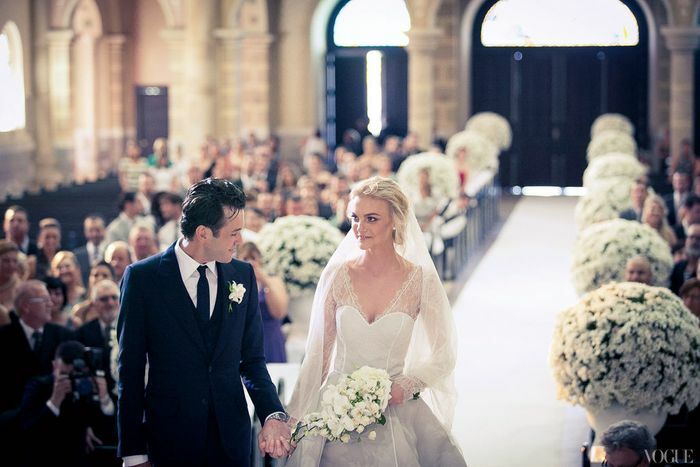 New York fashion lady Vanessa Traina’s wedding – beautiful and romantic white flowers ocean. New York fashion lady Vanessa Traina is a famous American best-selling author Danielle Steel’s daughter and in 2012 she held her aristocratic luxury and intimate wedding in her mother’s castle. At the ceremony held region, the green vine hanging from scaffolding on the roof, white flowers decorated the huge arches, people feel they are into a fantasy forest. The banquet hall was also decorated with white flowers throughout which add a touch of romance and fresh flavor for the luxurious classic room. Star stylist Caroline’s wedding – romantic colored flowers wall. As one of the most famous contemporary fashion stylist, Caroline Sieber have successfully created a British actress Emma Watson and other star performers, and often in collaboration with fashion magazines. 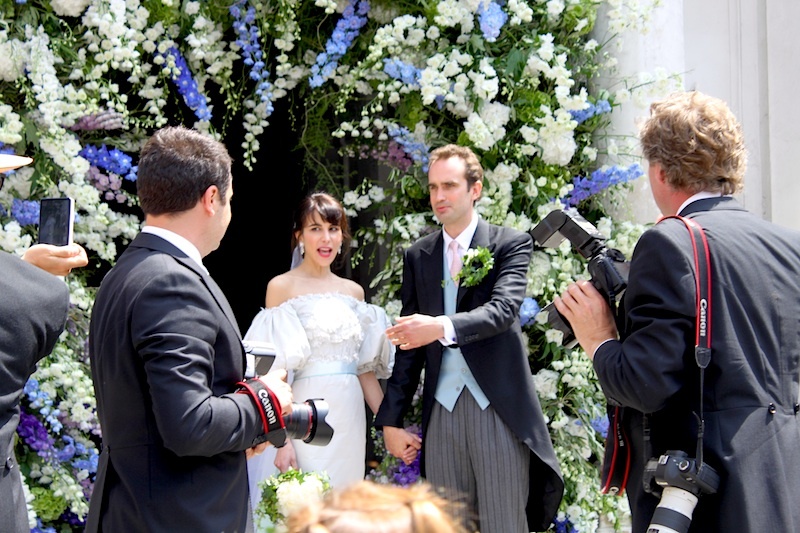 In 2013 she and her partner Fritz von Westenholz held their wedding in Vienna, Austria, at the entrance white and purple floral materials created a romantic flower wall, colorful blooms on both sides of sworn station was also lovely. Supermodel Kate Moss and Jamie Hince’s wedding – natural elegant British style. Supermodel Kate Moss in 2011 and Jamie Hince married in the Church of England, St. Peter, the wedding attracted the global attention, many guests attended the ceremony which made everyone was so exciting, the wedding dress “Pirates Lord” designed for “The Queen” also attracted a lot of topics. But except “Starlight”, the floral arrangement of the wedding was also enough romantic aesthetic. Whether it is the bride’s bouquet or flower girls’ garlands, are all filled with natural elegance of an English country style, leading to the church’s white “flower road” also made people forget to breathe! Supermodel Caroline Trentini wedding – beautiful pure white flower ball. Like Kate Moss, supermodel Caroline Trentini’s wedding photos also published on the “Vogue” magazine. “Baby Face” in March 2012 married fashion photographer Fabio Bartelt, the wedding was beautiful and moving, the channel toward the altar is decorated with white flower balls to add a little flavor of pure aesthetic for the church, hydrangeas and white tulips bouquet next to the banquet dessert is also very elegant and charming. 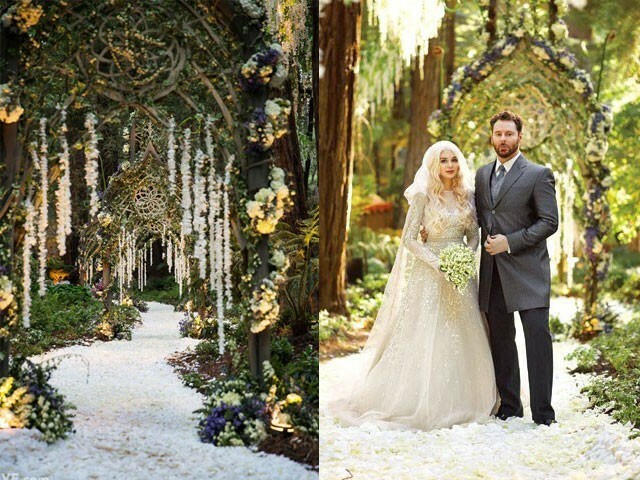 Social Media mogul Sean Parker and singer Alexandra Lenas’ wedding – a charming fantasy flowers forest. It is worth mentioning that, Parker also spent $ 4.5 million to invite costume designer Ngila Dickson of the movie “Lord of the Rings” to design clothing for 364 wedding guests, so all the details of the wedding were filled with fantasy charming atmosphere. Socialite Ivanka Trump’s wedding – pure white flower wall beauty. New York socialite, has been named the “world’s richest unmarried woman” Ivanka Trump tied the knot in 2009 with her fiance Jared Kushner officially. Ivanka Trump had been the world’s supermodel, has repeatedly boarded the U.S. “Forbes” magazine’s top ten richest unmarried woman charts, her wedding is big bucks, luxury beauty and romantic. Richest woman’s wedding scene was settled by the world’s top floral guruPreston Bailey, huge white column separated the sworn region into a special romantic sacred space, white wisteria pouring from the ceiling. Decorated the white like a fairy beautiful dream scene, a large using of Findra roses and butterfly orchid flowers arranged to settle the scene, fresh white milk let everyone addict to this pure beauty.